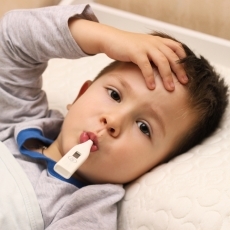 A fever is a body temperature that is higher than normal. A normal temperature can vary from person to person, but it is usually around 98.6 F. A fever is not a disease. It is usually a sign that your body is trying to fight an illness or infection. Infections cause most fevers. You get a fever because your body is trying to kill the virus or bacteria that caused the infection. Most of those bacteria and viruses do well when your body is at your normal temperature. But if you have a fever, it is harder for them to survive. Fever also activates your body's immune system. Treatment depends on the cause of your fever. If the fever is very high, your health care provider may recommend taking an over-the-counter medicine such as acetaminophen or ibuprofen. Adults can also take aspirin, but children with fevers should not take aspirin. It is also important to drink enough liquids, to prevent dehydration.